The pre-build thread with all the details is here. At this point I have installed the bare tank into my Office Wall, and the Sump Room was Stripped down for the new tank. Before I ripped out the 65 Gallon Tank the Sump Room looked like this. 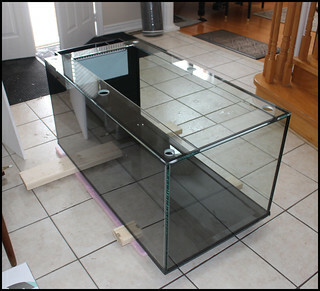 The Sump Room is home to the Tank, Associated SUmp and a Sump for a 2nd 95 Gallon Tank Directly on Floor above. I plan to make it better this time. Once these goals are Achieved, the Last Phase of the Build with be TO MOVE THE OLD TANK (Rock and Fish) into the New Tank, which I haven't exactly Figure out how. It would be a dream if I could have a sump room, keep all of the mess out of view and goodness in view. Looks like you have a great start to a awesome build. Following along. Aaaaaaahhh.. feels like home around here. Wow that looks awesome, I have my tank in my office as well, but this is amazing! I love that you can view it right at the desk level. Would make some of my long meetings much better . Following along! Whooops. I forgot to subscribe to my own thread, thus no email notifications...... so was thinking nobody posted anything yet. I learned that years ago, since my Kitchen Tank had all stuff running under the cabinet. Was great to move things down to basement Sump Room, Directly below. Glad you will tag along. I get inspiration from the folks ideas. So feel free to say anything, suggest anything, any time. Wecome back. Hey I was checking out your thread, and started at the beginning by mistake. Your Tank setup is also in-wall. I may have some questions for you. Welcome back.... to the Other Side of the TANK. I knew you were going to join the Dark Side. Couldn't Resist the FORCE? I am going to need you soon Matt, and your SPS GURU Level expertise. Really scared about when it come to moving things back into new tank. Welcome. I'd love to hear about your in-wall tank and thoughts, as I get going. I learned a lot from last time with the small 65 Gallon. In Wall Receeded had many drawbacks. Cleaning glass, and others things. Took away space from Sump room (which is good size but tight). I also raised the Tank this time about 1.5 inches. Great for Office side viewing, but I can already tell Reaching into tank is not ideal. So I haven't started anything yet. In a bit of Day Dream Planning mode. As per previous pre-build thread Sump Room is Very READY. THINGS WILL GO QUICK once I start. Right now I am looking at Overflow. And those HUGE bulkheads that came with the TANK. I don't have hose that fits. I'll post my problem shortly (with Photos) and maybe you folks can Help. Rakie's Bulkhead look similar but How to hook up a HOSE? I will answer and help with anything I can. My current set up is my 3rd in wall set up. Been busy with Family/School Events, otherwise I would have moved forward by now. Hoping to start something in next day or so. Still daydreaming about what I should start first. I have one idea (pre-test The Tank)....Hook up one of my OLD RETURN pumps and test tank flow into a bin....To ensure there are no problems with NEW tank, before I permanently seal it into wall and floor with Equipment. setup looks awesome. Makes me wish that I hadn't listened to the builders recommendation to remove the walls and have a sump room behind the tank. Keen to see more of the setup. What did you builder get you to do that changed your plans? Sure. When are you dropping by to help? Hey I got lucky with a similar Overflow (Flex Hose) setup like you have. Was going to head to home depot to get some Hard PVC to start at Bulkhead, but tried a bunch of junk/Pipe Hose I already have. Last edited by Wally.B; 02/28/2018 at 02:07 PM. Hose worked perfectly. No LEAK Snug. ABOVE SUMP ROOM PHOTO gives you an idea how the IN-WALL (Hidden Plumbing) will be setup. Will you have any new goodies for the sump? I dont' plan on changing the DIY Sump I built couple of year ago. But I am thinking of changing the Skimmer. I currently am using OLD EuroReefs for both tanks and they have been great. I got a RLSS DB8i Skimmer for a great price, but never really used it. It never worked well under light load. Sitting on shelf collecting dust. However I tested it in a small Tank Setup with a Large Crazy Eatting/Pooing fish, and the Skimmer Really kicked in. So with the Larger Tank and more fish, the Db8I might work. So this just came from Amazon. Only keeping one but wanted to see both colors. These 6" Mini Remote control Sub supposedly go Dive and Rise, Right/Left and Forward. In a salt water tank they would probably corrode, and I wouldn't take a chance on Copper Contamination with Corals. This will be fun, and I'll shoot a video. I have a question about your in-Wall TANK setups. How has the Drywall done over the year Above you tank (on the Tank side where there would be water spray)? Did you paint the drywall with any kind of High Gloss water resistant Paint? I was thinking some kind of Oil Based paint, but the stuff if Toxic and maybe just a good High Gloss Bathroom/Kitchen paint will be good enough. So far my drywall is doing just fine and that is with the tank all the way against the front piece of drywall (the stand is part of the wall so the tank sits flush against the drywall). I painted all of it with a oil base killz paint and then finished it with a high gloss. Also I am sure you are aware but make sure that the top of the wall, weather its drywall or trim, covers the top of the water line so you dont have the glare of the lights shining through. Yup, I need a lot of practice but the Remote Control Sub is pretty cool. The sub is a bit too big for my 110G. 1/10 the size would be better. Can't imagine doing this in Matt's Loaded Sprawling (delicate) SPS TANK. ENOUGH Distractions for ME (kids can play with it)......Time FOR ME to get working on the SUMP ROOM. That looks like a lot of fun. I didn't know you could buy little subs like that. Imagine a tiny sub with a camera on it. How cool would that be going in and around the rocks and corals. Don’t worry Wally, we can break some corals accidentally on purpose. Or completely on purpose. Yes, I looked at camera version Subs. Someday they will get smaller. It is fun, to master the control. But needs some obstacles for more fun. They even have these tiny ones from Air Hogs. Someone put one into their Reef Tank and Tang Beat it up. Really!!! We did talk about you keeping Shipping baggies. First this Tank need to get started up. Then Stable, and trust worthy. The OLD TANK and SUMP is in the way of my Wall just outside Sump Room. What I've done in preparation for the (NEW) TANK SETUP. ------> Higher Sump mean less Return Pump Height so more GAL/HR Flow on existing RLSS Return Pump. ------> Also Raised sump will give me STORAGE access underneath. Small improvement from last time (Foam Feet Underpads) For Quieter Running SUmp. YES THIS MEANS I'm going to start making water to fill the NEW TANK. I've been saving the New Media for NEW Tank Fill Up Time. Salt will be Tropic Maurin PRO.